Another Pricey choice, but used often. 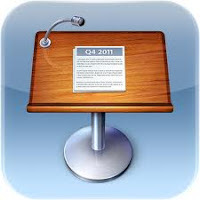 This app is like MicroSoft Powerpoint, but even easier to use. This , along with iMovie, was the main way my kids presented information. They created their on Keynotes to share with the class. This was an app that needed little instruction. The kids were teaching me tricks after just a few minutes.